Take a stroll through Hollywood, ride a bike from Santa Monica to Venice Beach, enjoy a bus trip to the Los Angeles Farmers Market, and visit a media museum in Beverly Hills — all on this full-day overview of LA. With an insightful guide, you'll see major landmarks and visit LA's lesser-known gems. Traveling on foot, by bicycle and on public transit, you can get a feel for local life, from UCLA to Rodeo Drive, on this small-group tour limited to 12 people. A cupcake tasting and the metro transportation costs are also included. Your LA day tour starts when you meet up with your small group and follow your guide on a walk down Hollywood Boulevard. See some of your favorite 'stars' on the Hollywood Walk of Fame, and pass by the TCL Chinese Theatre and Dolby Theatre en route to a secret garden oasis and other hidden gems. Hop on a local bus for a brief ride to the Los Angeles Farmers Market — aka the Original Farmers Market — established in 1934. Meander past old-fashioned food stalls selling fresh produce and tantalizing treats, and purchase something delicious for lunch (own expense). Then take a quick bus ride to the heart of Beverly Hills, and indulge in a provided cupcake tasting at a bakery. Afterward, visit the Paley Center for Media, where you can check out the costumes, sets and props on display as you learn about Los Angeles' film and television history. Follow up with a stroll down the posh shopping district of Rodeo Drive. Riding the bus through West Los Angeles, you’ll pass by the UCLA neighborhoods of Westwood and Brentwood. On arrival at the Santa Monica Pier, set off on a quintessential LA bicycle tour aboard a classic beach cruiser. Snap pics of the Pacific during a leisurely 6-mile (10-km) ride along an easy path to Venice Beach, home to Muscle Beach, funky shops and eclectic locals. 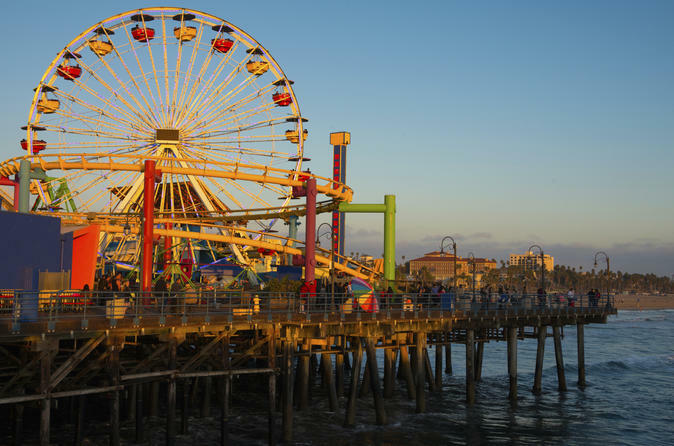 Finish your tour back at the Santa Monica Pier, where your guide can help you find public transportation or a taxi to your next destination. If you still have the energy, you are free to stay and explore Santa Monica’s Third Street Promenade and vibrant nightlife.